Tom Bettesworth was a surveyor before the war. He enlisted as a private in the Royal Sussex Regiment but was quickly commissioned into the Royal Fusiliers; he died from wounds after being hit in the head by fragments of an exploding shell. 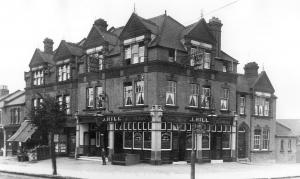 Tom Bettesworth was born at the Blakesley Arms, Station Road, Manor Park in the London Borough of East Ham on 4 December 1888, where his father was the publican. He was the first child of Thomas Bettesworth (1861–1900) and his wife Alice née Wells (c.1862–1900). Thomas, who was born at Stoughton, near Chichester in Sussex, died on 13 February 1900, following which the family moved to 12 Pembroke Avenue, Hove, where Alice died on 18 December 1900, leaving Tom and his sister, Alice Dorothy (born 1892) as orphans, in the care of Alice’s brother, Henry Wells. On 27 February 1915, Tom married Florence Emily Atterton (born 1893) at St Martins in the Field, London. Following his parents’ deaths, Tom was educated as a boarder at Brighton Grammar School. He later attended Malden College at New Malden in south-west London, where he served in the college cadet corps. 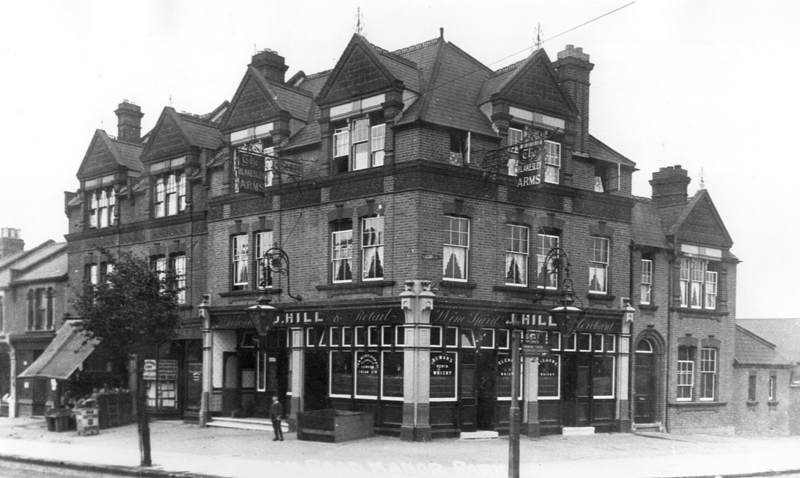 From 1905 to 1908, he served a three-year apprenticeship to the Portslade borough surveyor. At the time of the 1911 census, Tom (described as an “architect and surveyor”) was living at 63 St Andrews Road, Portslade by Sea with his grandmother and his sister and her husband, Edward Knowles. In 1910, Tom was proposed as a candidate for initiation into Adur Lodge No 2187, by Wor. Bro. Walter Hillman, treasurer, and seconded by Wor. Bro. Thomas Corringham, lodge secretary. At age 21, he was the youngest of five candidates initiated on 22 June 1910; the ceremony was conducted by Wor. Bro. Hillman. Wor. Bro. Walter Hillman (1851–1926), was chairman of Portslade Borough Council for eleven years and a Justice of the Peace for 22 years. He traded at 13 and 29 North Street, Portslade as a “corn merchant, hay and straw dealer, seedsman and general carting contractor”. He was also a founder of Duke of Richmond Lodge No 3143 in December 1905, which originally met at the Assembly Rooms in Portslade, into which he initiated Edward John French in March 1908. Lieutenant Edward French was lost in the sinking of HMS Good Hope at the Battle of Coronel on 1 November 1914. Tom was passed to the second degree on 26 October and raised to the degree of a master mason on 30 November 1910. He was presented with his Grand Lodge Certificate in the lodge on 12 December 1910. Tom enlisted at Hove on 4 September 1914, joining the 3rd Battalion of the Royal Sussex Regiment with Service No 1191. He was promoted to acting corporal on 12 September and stationed at Fort Burgoyne at Dover. On 29 December 1914, he was commissioned as a second lieutenant in the 12th Battalion, Royal Fusiliers (City of London Regiment). On 1 September 1915, he was sent to the Western Front and on 11 October he was attached to the 172nd Tunnelling Company of the Royal Engineers. The tunnelling companies of the Royal Engineers were occupied in offensive and defensive mining involving the placing and maintaining of mines under enemy lines, as well as other underground work such as the construction of deep dugouts for troop accommodation. In October 1915, the 172nd Company were at The Bluff, between Voormezele and Hollebeke, south of Ypres; this was an artificial ridge in the landscape created by spoil from failed attempts to dig a canal. With its additional height in an otherwise relatively flat landscape, The Bluff was an important military objective. On 26 October, Tom Bettesworth was hit in the head by fragments of a shell. He was sent 120 km behind the lines to the 20th General Hospital at Camiers, near Etaples on the Channel coast where he died from his wounds on 3 November. 2/Lt Tom Bettesworth was attached to this Company as a Brigade Mining Officer. He was in the trenches superintending the mining works when the enemy exploded a mine. He was actually in the front line fire trench when part of a shell from the accompanying bombardment struck him in the head, from which he unfortunately never recovered. Tom Bettesworth was buried at Etaples Military Cemetery, close to the site of the hospital at Camiers where he died. Apart from the Masonic Roll of Honour, he does not appear to have been commemorated on any other war memorial. Tom was awarded the 1914–15 Star, the British War Medal and the Victory Medal. It is absolutely necessary for me to state that he was universally liked by all and the entire Company agreed that King and Country have lost one of their best friends. Several members of the Company, Brother Masons would like it to be put on record that late Bro Bettesworth lived and died a true man in every sense of the word. A letter of sympathy was sent from the lodge to the widow of Bro. Bettesworth. Tom’s brother in Law, Frank Atterton also served in the First World War, initially as a sergeant in the 7th (The Princess Royal’s) Dragoon Guards before being commissioned into the Royal Engineers. Frank survived the war and remained in the army, reaching the rank of captain and being made MBE in the 1933 Birthday Honours. Shortly after his death, Tom’s colleagues Lieutenants Arthur Hibbert and Richard Brisco were both awarded the Military Cross for conspicuous gallantry, when their mining company broke into a German gallery. Hibbert and Brisco came under fire, but succeeded in blowing in the enemy gallery “thus forestalling the Germans”. Sadly, Lieut. Brisco was himself killed at Vimy Ridge in April 1917. Tom’s widow, Florence never re-married and continued to live in Brighton after the war. On Monday 29 March 1943, four German aircraft launched an attack on Brighton, machine-gunning the town and dropping several bombs. One bomb hit Florence’s home at 20 Gloucester Place, near the Astoria Cinema, killing her and destroying several neighbouring properties. Another bomb fell on the nearby school clinic in Sussex Street, killing three children and a clerk. With special thanks to Very Wor. Bro. Grahame Carr PDProvGM (Sussex) for supplying the extracts from the Adur Lodge minute book for the period from 1903 to 1918. CWGC Casualty Details: Bettesworth, T.
The National Archives: WO 339/5154 2nd Lieutenant Tom Bettesworth. The Royal Fusiliers (City of London Regiment).